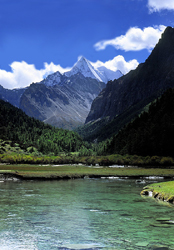 Generally speaking, Western Sichuan is composed of five main mountain ranges more or less running north-south. Due to their various and highly different features concerning altitude, topography, and natural and man-made environment within an area of about 330.000 sqm there are plenty of alpine opportunities satisfying each mountaineer‘s demand. 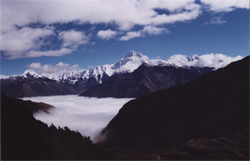 Hiking besides a wide stream leisurely meandering through the Tibetan High Plateau or climbing up the glaciers of the 7556m high Minya Konka may be mentioned as simple instances. Only a few places had the (bad) luck to being opened up for extensive tourism, such as Jiuzhaigou or Emeishan. For these reasons there are many places still undiscovered (including umpteen of unclimbed peaks between 5000m and 6700m) what has the side effect that they mostly lack in accessibility. We are offering mountain trekking with duration of 3 to 27 days, expeditions in undiscovered areas and onto summits, and rock climbing to you. Of course, individual consulting, custom-made planning and intensive support do belong to our basic service. Detailed tour description you will find below. For further information also consult the page about Sichuan. For maps please follow the link maps. In order to successfully accomplish your expedition we provide all-round service to you. Our logistics and supply include accommodation, food, and medical care for the time until we reach and after we abandon the base camp, and within the base camp. Specific gear and equipment depend on individual demands and are treated respectively. I.e. items not included in the base camp supply such as ice tools, food for advanced camps, oxygen etc. have to be brought along individually or have to be ordered in advance. 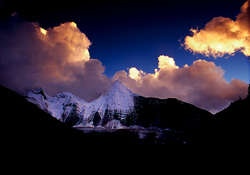 The ascent of most peaks requires payment of ascent fees charged by the Sichuan Mountaineering Association. Depending on height and other circumstances the fees are quite different. Below you will find a short description of recommendable expedition mountains. For more detailed or further information on other mountains please email to wstourix gmail.com. Due to a high hazard exposition and abnormal physical strain on a mountain expedition we do assume no responsibility for the whole undertaking. Unforeseeable accidents or emergencies (avalanches, weather, crevasse, etc.) may lead to an abort of the expedition. Thus, we refuse any kinds of claims for damages. This will be stipulated before departure. A long time ago, four beautiful and kind-hearted girls, in order to save their treasured giant panda, fought bravely with a ferocious leopard and thus became four graceful mountains standing tall and straight: The Siguniang Mountain. Rising at 6250m, 5355m, 5276m and 5025m above sea level respectively, the four peaks comely stand shoulder by shoulder in the middle reaches of the Qionglai Mountain Range. Yaomei Feng (peak of the youngest girl) is with 6250 m the highest one. Perennial erosion made it extremely steep and full of precipices and steep walls. Plenty of glaciers hover in the air, hanging on the south slopes of the main peak while the glacier tongues go right to the foot of the mountain. Much easier to climb are the three other sisters and some adjacent peaks such as Yangmantai (5666m) or Luotuo Feng (5484m). Nimbleness and basic skills in walking with crampons are the only required qualifications for these routes which entirely belong to our general Siguniang programme and can be accomplished within 5 to 8 days in general. The ascent of the peak of the youngest and highest sister should be calculated with duration of two weeks. Perfect ice climbing skills and rich alpine experience is requested to challenge this summit. For a long time the alpine world wondered if there really should exist another mountain higher than the Mt. Everest: A mountain deep in the remote Xikang province, anywhere between Tibet and Sichuan (as this area was called until the 50ies of the last century). This rumor lasted for a couple of decades because there was no western geologist finding the way to the awe-inspiring glacier world of Minya Konka. Due to its majestic height in relation to the surrounding peaks, one surely will be impressed when watching it from the Buddhist mountain Emei Shan or out of the air plane when landing in Chengdu. Not many ascents of this holy mountain have been tried, only a few of them were successful, some of them even had to pay a high tribute. For those who did not plan to challenge this giant ice peak, we offer two delicate expeditions to the neighboring summits Reddomaine (6110m) and Dogonomba (5958m) in the northern part of the range, and Mt. Nochma just besides the King of the Mountains. Although these tours are not as difficult as Minya Konka itself, but one needs excellent roping and climbing skills for safe moving within high gradient glaciers, as well as a good portion of patience due to the weather is quite unstable. For one tour should be calculated with 12 to 15 days of duration, for just the hike to the base camp takes 3 days itself. While hiking across mountain ranges from valley to valley, the wanderer will experience the marvelous change of landscape, soil, vegetation, and rock. On routes leaving the Sichuan Basin to the West, for instance, everyone is able to retrace a visible change of vegetation. Plants that grow in humid habitat become less and less, and due to the more and more arid climate cacti and oak shrubbery become more and more common. Hiking up the narrow valleys of Gyarong onto the wide Tibetan High Plateau you will feel your mind is following the landscape and inhales a breeze of release. 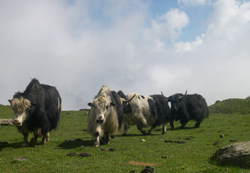 Our trekking tours reach from two to 26 days of duration. Shorter ones are more or less small hikes on mountains not far from Chengdu with accommodation in monasteries or family driven guest houses. For active participation in the miraculous change of nature you should be prepared for at least four days of walking and accommodation in tents. On some of the tours there is a disproportionately high number of important cultural monuments, thus, these are designated as cultural trekking tours. In the heart of the Gyarong area, following cliffs and lush meadows, the Mengdun River and its smaller tributary brooklets rush down from about 5000m high rock towers. Start of this tour is a typical village of Gyarong. The track leads us through thick rhododendron forest and along two beautiful lakes. A narrow notch inside a high rock formation makes for a pass to Maoxian County and further on to a traditional village of the Qiang people, the final aim of this trekking route. This route is due to a lack of good guides extremely uncommon but very typical for the mountains along the Sichuan Basin fringe. The ascent begins behind a mine, and leads directly into subtropical jungle. We pass along waterfalls and canyons which's bottom nobody ever has trodden (except Pandas). After two and a half days we reach the ridge that leads us to the pasture beneath the foot of Mt. 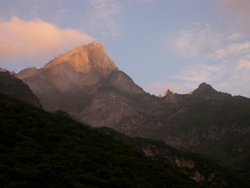 Shiziwang (Lion King) the highest peak of the Jiudingshan Massif. Recreated by the peaceful atmosphere it is only a leap to its summit. Two days of descent down into the arid MinJiang Valley may feature the differences in climate and vegetation in an extremely obvious and astounding way. Getting off the pavement in Rilong town we follow the Changping Valley to the North. We leave the Four-Sisters Mountain (6250m) behind us. The track towards the pass rises smoothly but drops heavily when reaching it. Down to the Bipeng-Valley, another kind of both, rough and sharming alpine landscape welcomes us. On more than 80km way we cross high alpine territory, carpets of green grass, luxuriant forests, clear valley brooks and an alpine biosphere with many endemic species and plenty of pieceful solitude. The hike begins within the matriarchal territory around Lake Lugu. Via many traditional villages of the Yi, Moxi, Mongol, Tibetan people and other ethnic groups we head directely to the centre of the triangular mountain massif. Over a pass at its eastern side we follow the way to two bewitching lakes, surround Mt. Chenresig, and further on reach at the highest point of our journey, the Songduo pass (5200m). After enjoying the splendid panorama we bid farewell to the awe-inspiring but icy rock and glacier world and sneak off through the Hell's-Canyon. The last two days we explore Mt. Haizi Shan on a relaxing promenade off road. Mt. Haizi Shan is a huge geological relic of glacier cover which existed during the last ice age. The route begins in Danba, a very spectacular place: Hundreds of defence towers are scattered in narrow valleys through which we hike to the hot springs beneath Zhara Lhatse. Here we saddle our Ponies and pass through rolling hills and wide grassland towards Nyagrong (chin. Xinlong). In Nyagrong we enter a fascinating labyrinth of 108 lakes that lies on an elevation over 4000m and leads us to the south slopes of Mt. 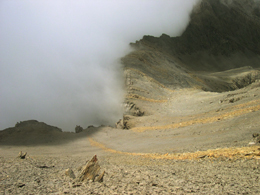 Kawaluori (5992m). The pass across its icy edges is the last task we have to cope with until we reach our destination: Garzê town. We also offer ice climbing and rock climbing. Our ice climbing base camp was especially set up for you. Because of rock climbing is not very popular in China yet, you have a big choice of unclimbed routes in carefully selected areas. For further information please write or phone us. Except our permanent programme there is still a high number of routes, mountains, areas, and other alpine features waiting for you. We would be very pleased to helping you arranging your own trip, holidays or expedition. Feel free to contact us to obtain consultancy. The only thing you have to provide to us is some information about duration and date, number of persons participating, and the grade of alpine level you want your route to be designed.